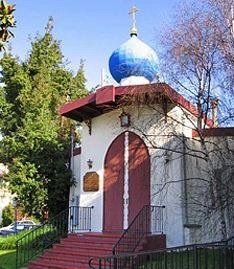 Saint John the Baptist Russian Orthodox Church is a parish of the Diocese of the West of the Orthodox Church in America. We are located at 1900 Essex Street, Berkeley, CA 94703, on the corner of Essex and Adeline Streets, next to the Ashby BART Station. Services are in English and in Church Slavonic. All are welcome! 6:00pm- Vigil or Vespers on Saturday evenings and on the eve of feasts. 10:00am- Divine Liturgy on Sundays and feasts occurring on Saturdays. 8:00am- Divine Liturgy on feasts occurring on a weekday. Our parish follows the Julian (Old) Calendar. In addition to this website, our parish maintains a facebook page, which may be accessed here.